Rank and organization: Sergeant, U.S. Army Air Corps, 423d Bombardment Squadron, 306th Bomber Group. Entered service at: Caro, Michigan. 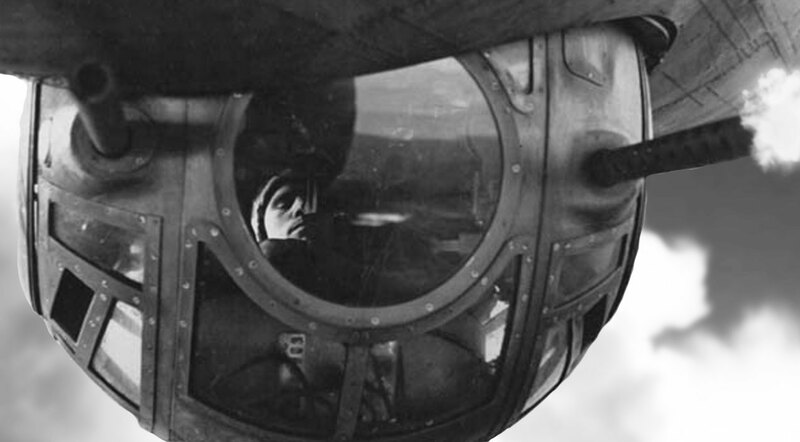 Sergeant Smith was a ball turret gunner on a B-17 Flying Fortress on his first combat mission. 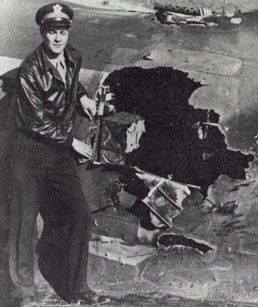 The bomber was so badly damaged that, on landing, the airplane’s structure failed from battle damage and it broke in half. There were over 3,500 bullet and shrapnel holes. Maynard Harrison Smith was born at Caro, Michigan, 19 May 1911. He was the second child of Henry Harrison Smith, a lawyer, and Mary Christine Gohs Smith, a school teacher. Smith worked as a clerk in a government insurance office. He married Miss Arlene E. McCreedy at Ferndale, Michigan, 31 July 1929. They had a daughter, Barbara Lou Smith. They divorced 22 October 1932. He later married his second wife, Helene Gene Gunsell, at Caro, Michigan, 30 March 1941. Maynard Smith enlisted in the U.S. Army Air Corps, 31 August 1941. 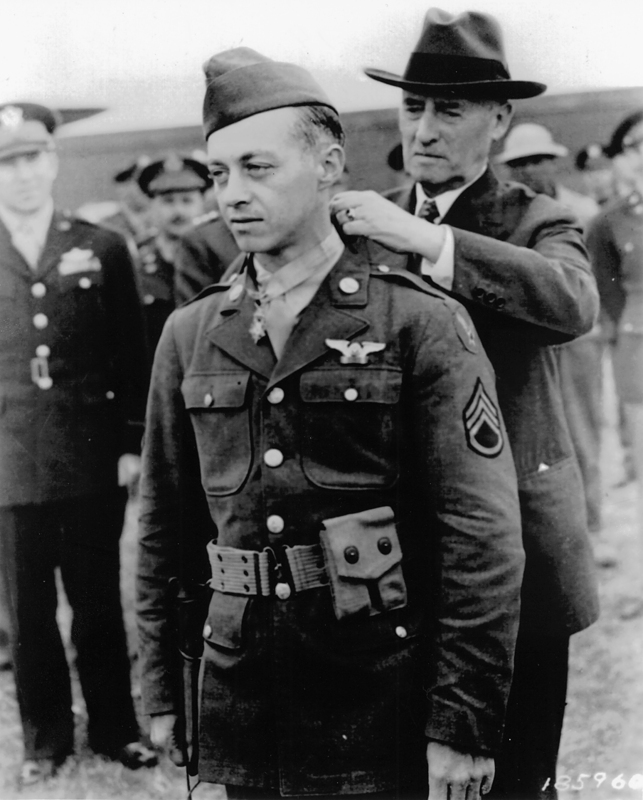 He was trained as an aerial gunner, and on completion, was promoted to the rank of staff sergeant. 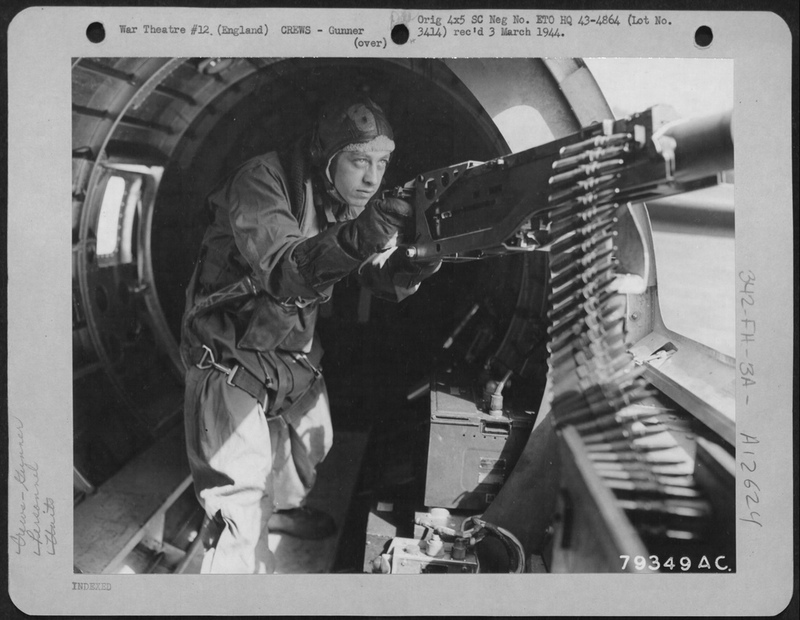 He was assigned as a ball turret gunner in a B-17 combat crew of the 423rd Bombardment Squadron (Heavy), 306th Bombardment Group (Heavy), based at RAF Thurleigh, Bedfordshire, England. A gunner fires the two Browning .50 caliber machine guns of his electrically-powered Sperry ball turret. 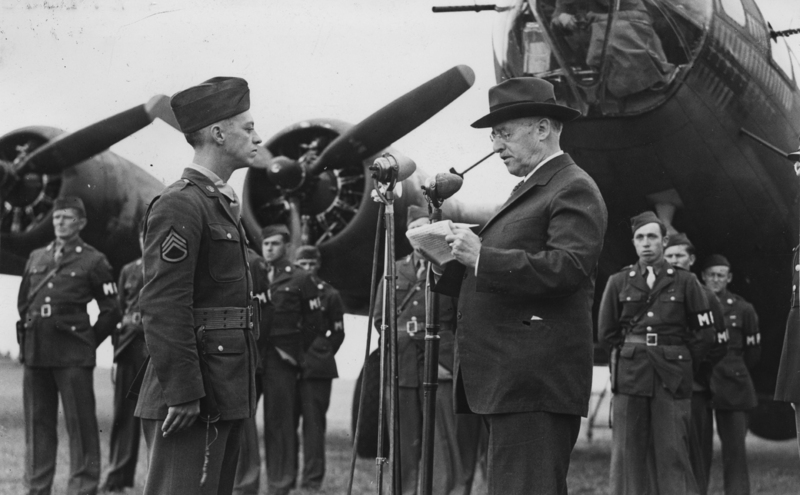 Following the 1 May mission, Staff Sergeant Smith flew only four more combat missions before a medical board diagnosed him with Operational Exhaustion. He was removed from flight status and reverted to his initial rank of private. While stationed in England, Sergeant Smith met Miss Mary Rayner, a British subject and USO volunteer. They were married in 1944. They would have four children. Sergeant Smith was released from active duty, 26 May 1945. Following World War II, Smith worked for the Department of the Treasury. He later founded Police Officers Journal, a magazine oriented toward law enforcement officers. Based on an examination of certain facts in his life, as well as anecdotes by persons who knew him, it is fair to say the Maynard Smith was a troubled individual. But the extreme courage he displayed on 1 May 1943 cannot be denied. Maynard Smith died at St. Petersburg, Florida, 11 May 1984 at the age of 72 years. He was buried at Arlington National Cemetery. 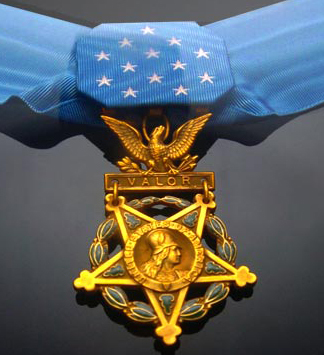 Staff Sergeant Maynard Harrison Smith, United States Army Air Forces, was the first of only five Air Force enlisted airmen to be awarded the Medal of Honor during World War II. He was also awarded the Air Medal, with one oak leaf cluster (two awards). Boeing B-17F-65-BO Flying Fortress 42-29649 was delivered to Denver, Colorado, 29 January, 1943. After crossing the North Atlantic Ocean, the new bomber was assigned to the 423rd Bombardment Squadron (Heavy), 306th Bombardment Group (Heavy) at RAF Thurleigh, near Bedford, Bedfordshire, England, 24 March 1943. It was identified by the letters RD-V painted on its fuselage. On 1 May 1943, 42-29649 was one of 18 B-17s of the 306th Bombardment Group assigned to attack German Kriegsmarine submarine pens at Saint-Nazaire, on the Atlantic coast of France. Another 60 B-17s from three other groups were also part of the mission. 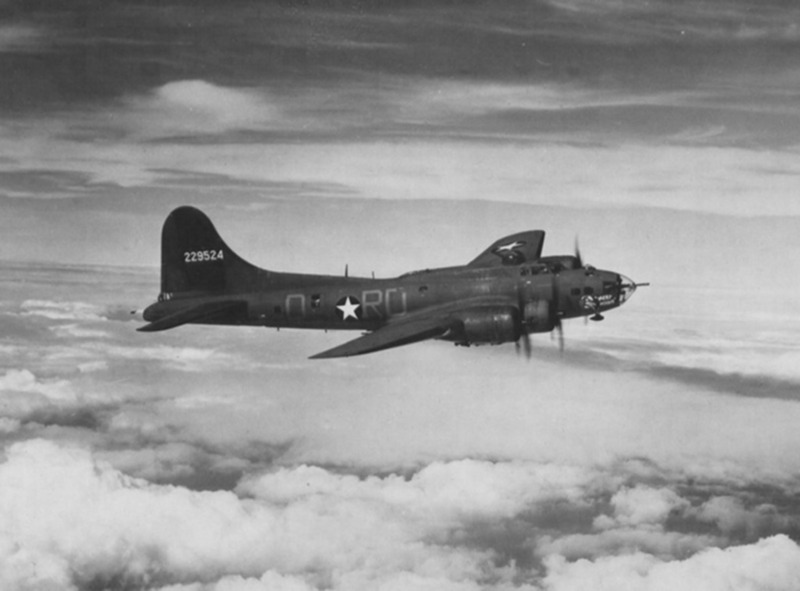 Only 12 bombers from the 306th arrived over the target, which was heavily obscured by clouds. Each bomber carried two 2,000-pound (907 kilogram) General Purpose bombs, which were dropped from 25,200 feet (7,681 meters) on a heading of 270°. After a 20-second bomb run, the group released its bombs at 11:26 a.m. Flying away from the target area, the 306th flew over the city of Brest at low altitude. 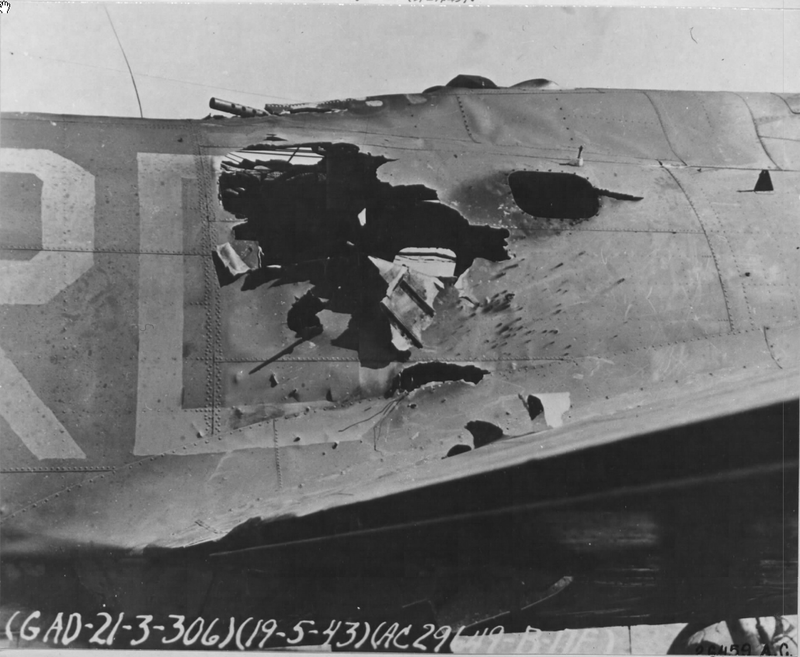 42-29649 was hit by anti-aircraft fire. The group was then attacked by 15–20 Luftwaffe Focke-Wulf Fw 190 fighters. Two bombers were shot down over the city and a third ditched near the coast. -649 caught fire and three crewmen bailed out over the water and were lost. Of the 78 B-17s dispatched, 7 were lost. 73 crewmembers were listed as Missing in Action, 18 Wounded in Action and 2 Killed in Action. On 1 May 1943, 42-29649 was flown by Captain Lewis P. Johnson, Jr., aircraft commander/pilot; 1st Lieutenant Robert McCallum, co-pilot; 1st Lieutenant Stanley N. Kisseberth, navigator; Staff Sergeant J.C. Melaun, nose gunner and bombardier; Technical Sergeant William W. Fahrenhold, flight engineer/top turret gunner; Staff Sergeant Maynard H. Smith, ball turret gunner; Technical Sergeant Henry R. Bean, radio operator; Staff Sergeant Robert V. Folliard, waist gunner; Staff Sergeant Joseph S. Bukacek, waist gunner; Sergeant Roy H. Gibson, tail gunner. Sergeants Bean, Folliard and Bukacek were killed in action.